INDIANAPOLIS, IN. – The Kroger Co. and racing star John Andretti today celebrated a new record in their annual fundraiser for Riley Hospital for Children. The 2018 “Race for Riley Presented by Pepsi” raised $377,141.28 to support the life-saving work done at Riley Hospital. The total represents generous donations provided by Kroger customers and store associates. The previous record for the event, set in 2017, was $350,000. “The donations represent the tremendous respect Hoosiers have for Riley Hospital and Kroger is extremely proud of our partnership with John Andretti and Riley,” said Pam Matthews, president of Kroger Central Division and a Riley Children’s Foundation board member. “People across the state and around the country know they are never more than a few hours away from innovative attention provided by Riley specialists,” Matthews said. 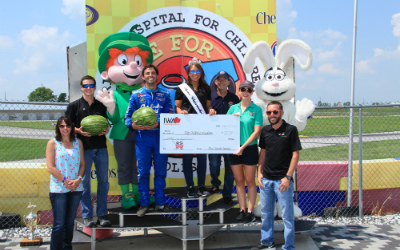 Andretti and Kroger presented the check to Riley at the store that surpassed all other Indiana Kroger stores in this year’s campaign. The associates and customers of the Kroger at 7101 E. 10th Street raised $20,421. Planning is already underway for the 2019 Race for Riley Presented by Pepsi.